Do you want some good food, friends and fellowship? Then this is the group for you! Dinner for Eight groups join eight willing people together, and they will plan meals, games and other activities in their homes, restaurants or other establishments in order to get to know one another better. This is a great opportunity to meet new people in the church or spend more time with friends. Once groups are formed, the first host will be selected from the group roster. He/she will contact members to arrange the details for the first gathering. Dinner groups are encouraged to be creative; consider picking a dinner “theme night” (i.e. Italian, dessert or soup night), and everyone can bring a dish that goes along with that theme. Groups for the winter have already been formed, but we'll form new groups again soon! Childcare is provided for groups that meet on Wednesdays. Learn more and register below. Dinner for Eight is a great way to meet folks from church that you may not already know. It’s also a good way to get to know your church family better. Groups plan their own meals and get together once a month for three consecutive months. You share meals at participants’ homes, at local restaurants, the church or wherever the group decides. The emphasis is on fun and fellowship, so you don't have to be a gourmet cook to participate. Simply fill out the online registration form below. Once groups are formed, a Group Coordinator will be selected for each group. The Group Coordinator will contact members to arrange the details for the first gathering. Dinner groups are encouraged to be creative in the meals they enjoy together. This is the point person for the Group. The Group Coordinator contacts group members to select the location, date, and food sign-ups for the first gathering. It is highly recommended that future gatherings are scheduled during your first night together. It's potluck! Usually the host will make the main dish, and other participants will bring coordinating sides or desserts. Potluck dinners are also a good way to simplify meal planning and distribute costs equally among everyone in the group. Consider picking a dinner "theme night" (i.e. Italian night, backyard barbeque, soup night, etc. ), and everyone can bring a dish that goes along with that theme. Some groups may also choose to visit local restaurants or other venues. I don't have room to host a dinner, or I really can't cook! Our desire is for you to spend time together getting to know each other and include everyone. Your group may choose to repeat a host home or eat out. If finding a host home is difficult, your group is welcome to schedule dinner at the church. We want everyone to feel that they can participate. As Dinner for Eight groups are formed, our goal will be to put people together so that each group has, at most, eight adults. Groups may be comprised of all couples, two couples and four singles, one couple and six singles, etc. It all depends on who signs up. The mystery is part of this ministry's excitement! Kids First childcare will be provided on two nights- January 2 (5:30-8:30) and January 9 (5:00-7:30)- to allow groups to meet for their first gathering without needing to arrange childcare. After your first dinner, you could decide to meet again on Wednesday nights when JAM is is session (and childcare would be scheduled and free.) Or you could meet on a different night and either include kids, or arrange for your own childcare. Hopefully, you will have had a rewarding experience and look forward to similar experiences at Royse City First United Methodist Church. 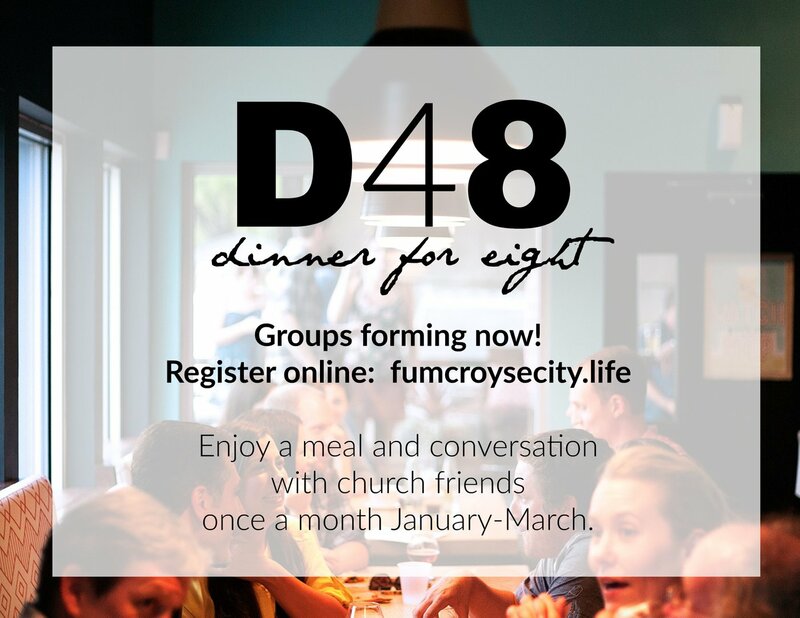 After the last gathering, you may decide to sign up for another round of Dinner for Eight with a different group of folks, or your group may wish to stay intact and continue as a small group. If you choose to stay together as a small group, April can provide resources to help you add elements of study and service to your small group and to continue to deepen the fellowship you have already established. Sounds like fun! Can I sign up anytime? Yes! Group formations are ongoing. Fill out the form below and April will be in contact with you.